Stress and Coping — Jason K. White, Ph.D.
What is stress? Stress is something we talk about and ‘manage’ all of the time, but it can be challenging to precisely define for some people. Stress is simply a challenge to meet either an internal or external demand. Stress can be a painful emotion like sadness or fear when we face the death of a loved one. Stress can also occur when we are running late to an important meeting or have difficulties meeting the demands of our various or conflicting roles. When people discuss ‘stress’ they are typically talking about ‘distress’ or the negative side (or right side of the curve below) of the stress continuum. This is the type of stress that is uncomfortable or painful and leads to worsened performance (e.g., lower grades, decreased productivity, concentration problems, etc.). However, there is another type of stress known as eustress, which receives less attention. This type of stress is motivating and helps us do better. Eustress is recommended for those who are under-motivated or under-performing to their potential. Increases in eustress can lead to improved performance and higher functioning in these situations. Difficulties arise, however, when someone applies pressure to another person to increase performance due to a mistaken belief that they could benefit from eustress. For example, someone with an undisclosed anxiety issue at work might appear to be ‘slacking off’ and their supervisor decides to confront these avoidance behaviors with goal of improving performance only to find that the problems worsen because the employee was actually experiencing distress rather than eustress. See the following curve for a visual representation. 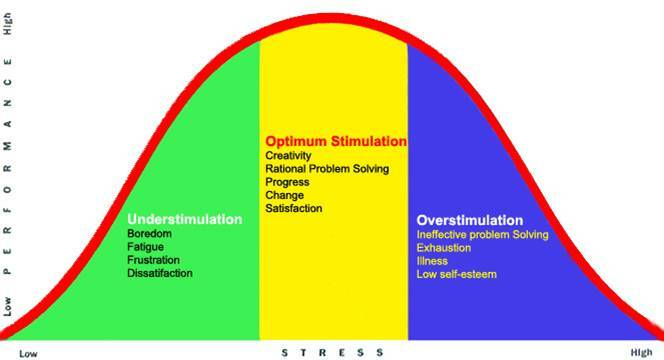 Eustress is on the left side incline leading up to optimal performance (green leading to yellow) whereas distress is on the right side decline leading away from optimal performance (yellow leading to blue). What are common sources of stress? Many people think of unwanted events in life as stressful. For example, an unwanted job termination or being laid off, a relationship difficulty, or an unexpected financial obligation can be stressful. However, stress is also associated with positive life events and changes. Getting married. Moving to college. Retirement. These are life experiences that many people look forward to for years, yet they come with their fair share of stress. Do you know of anyone who had a stress-free wedding? There are several negative impacts of stress. Some are physical like sleep disruption, unwanted appetite and weight changes, medical illness, and fatigue or loss of energy. Other consequences of stress are emotional such as helplessness, hopelessness, irritability, etc. Cognitive symptoms of stress include concentration problems, memory deficits, difficulties talking, and over-focusing on worst case scenarios. Lastly, stress can lead to behavioral indications like social withdrawal, changes in hygiene or appearance, low motivation, or substance use. These indications of stress can lead to decreased functioning at work or school, problems in relationships with close friends or family members, and reduced quality of life overall. However, there are many options to deal with stress to minimize the negative impact. When people face stressors and difficult times, there are two basic ways of approaching how to deal with the situation. If the person has some control and power with the issue or outcome, problem-focused coping might be recommended. This is when someone attempts to change the situation and can include problem solving, making a decision, taking action, changing something about their approach, etc. This type of coping is traditionally associated with masculinity, but is something we all engage in regardless of our gender identification. For those socialized in more traditional gender value systems, boys and men might have more opportunities to learn problem-focused coping. Examples of stressors that might benefit from a problem-focused coping strategy include relationship difficulties (where one focuses on what they can do differently to improve the relationship or decide to leave it), job dissatisfaction, under-assertiveness, or goals for self-improvement like exercise, eating healthier, and avoiding harmful substances. For more information on Physical Self-Care-see this earlier blog post. The other approach to managing stress is emotion-focused coping which often helps a person deal with the associated emotions and thoughts about the stress. This does not change the situation, as some people mistakenly hope, but rather one’s mental approach to the situation. I recommend emotion-focused coping for stressors in which the person has very little or no control of the situation or outcome. Some examples might include the death of a loved one, an unwanted job change, and health/medical concerns. This approach is traditionally associated with femininity especially for those with more traditional socializations, but can apply equally regardless of gender. Traditionally socialized girls and women may default to using emotion-focused coping due to experience and familiarity. Many of my clients come to me when their usual problem-focused coping strategy no longer works. This might be the first time they have experienced a stressor in which they had little or no power or control, or they may not be used to emotion focused coping. Instead of trying to change the situation, emotion-focused coping focuses on helping the person deal with the emotional impact of the stressor in healthy ways. I often hear people ask why they should discuss their past experiences, since they are unable to change the past. While this is true about our inability to change the past, it indicates an over-focus on problem-focused strategies. I counter with an explanation about how discussing past experiences within a safe and trusting therapeutic (or other) relationship can reduce the impact and influence (conscious or not) those past experiences have on one’s emotions, thoughts, and functioning. Taking emotion-focused coping one step further, I often use a container analogy with my clients. Imagine that everyone has an ‘emotional container’ within them. These containers are different sizes. Some people have rather large containers whereas others have much smaller spaces. As we have experiences and emotional reactions to those experiences we can choose to express that/those emotion(s) and move on with life. On the other hand, we might choose to ‘stuff’ that feeling in our container to deal with it later (healthy in many situations) or ignore it completely (usually unhealthy in the long-term). There can be many reasons to not deal with our in-the-moment emotions. We might be in a situation where it is necessary to appear non-emotional to prevent judgment from others or get through a situation that needs a problem-focused approach. However, when a person repeatedly ‘stuffs’ their feelings in their emotional container without dealing with or processing those feelings later, the container eventually gets full. When a container is full, a couple of things can occur. First, this is when people typically start experiencing symptoms of anxiety or depression that bring them into treatment. Second, there is no more room in the container for new emotions, so a person is forced to begin dealing with their feelings, which can be daunting to those unfamiliar with the process. · Positive self-talk-changing internal interpretations about one’s self in relation to experiences, especially patterns of repeated experience. · Some people even enjoy cleaning! I warn clients that there are some harmful and unhealthy comfort strategies to be avoided. Spending too much time online, impulse shopping, and harmful substance use are some common examples. Be sure that your comfort strategies are healthy and not over-used. If you or someone you know has a stressor(s) and need assistance with either problem-focused or emotion-focused coping (followed by self-comfort strategies), give me a call at 405-614-2846 to get started.